A lightweight bout has been added to UFC on FS1 #2 in Indianapolis as Roger Bowling will face Abel Trujillo. UFC officials announced the fight booking on Monday and the fight will take place on the preliminary card. UFC on FS1 #2 takes place from the Bankers Life Fieldhouse in Indianapolis and will be headlined by former interim welterweight champion Carlos Condit facing Martin Kampmann in a five round welterweight bout. 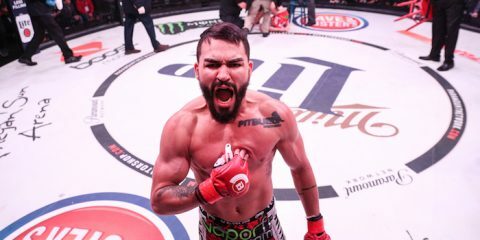 Bowling (11-4) is a Strikeforce veteran and lost his UFC debut earlier this year as he was defeated by Anthony Njokuani at UFC on FOX 7. It was his second straight defeat as he was defeated by Tarec Saffiedine in his final Strikeforce fight. Trujillo (10-5) won his UFC debut at the end of 2012 when he defeated Marcus LeVesseur at UFC on FOX 5. It was his fifth straight victory and his win streak was snapped in his second fight in the UFC as he was defeated by Khabib Nurmagomedov at UFC 160.